What better way to create the perfect alchemy between the origins of history, the ethics of sport at its very beginnings, ancient culture, the great classical myths and the modern world? Our excursion will offer us a chance to get to know all these aspects in one single place: Olympia. 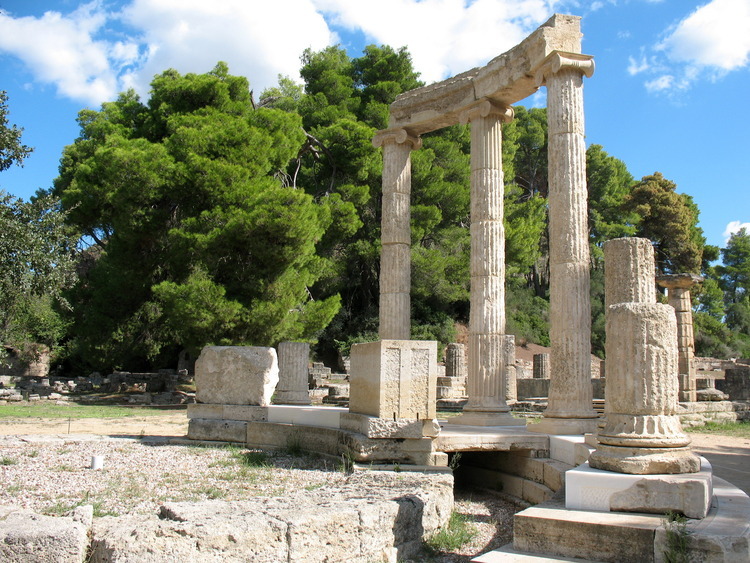 We leave the port of Katakolon to discover the ancient sacred city of Olympia, full of temples, monuments, priests' houses, athletes' homes and public buildings. A gem set in a valley crossed by the River Alfios in the north-west Peloponnese, the city held the famous Olympic Games in honour of Zeus every four years. Here in 776 BC, a list of winners was drawn up for the first time, presumably the results of the very first Olympics in history. As we stroll around ancient Olympia amongst the archaeological excavations, it feels as though we can still hear the spectators shouting to encourage the athletes and breathe the festive atmosphere, which accompanied those 5, very long days, during which the best athletes challenged each other in the various sports: wrestling matches, charriot and horse races, the pentathlon and pankration (a primitive form of boxing). Let's delve into the past and discover the little secrets of the competition, which was first accessible only for male athletes of Greek origin and was later opened up to young Romans. Perhaps not everyone knows that women and slaves were banned from the town, the sanctuaries and the terraces, at the risk of a terrible death by being thrown from a nearby cliff. We will stop in the ancient squares, where traders and citizens once met to carry out their business. At the end of our guided tour, we have to wake up from the spell of the past and return to reality if we are not to miss the chance of discovering the streets of modern Olympia. We can taste a typical, strong, Greek coffee, savour a cool glass of Ouzo or, if we wish, purchase a souvenir to remind us back home of a piece of history which made us live a dream. The excursion involves walking for about 1 hour and 30 minutes, it is therefore recommended to wear comfortable shoes and clothing. Large backpacks are not allowed inside the museum or the archaeological site. This excursion is not recommended for guests with mobility problems. ?